The gaming-obsessed European country saw its MMO market grow a blistering 24% rate - far faster than even the US expansion of 14% -- and more of their gamers are spending top Euros on online game transactions. To be exact, 59% of German players splurge on MMOs compared to just 46% of their stateside counterparts, according to the latest industry data from MMO Metrics. In raw numbers, this still translates to 23 million US players who spend money on free-to-play or subscription MMOs. 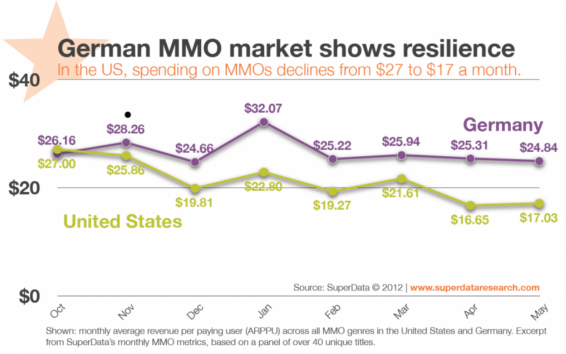 The problem is that US MMO players are spending noticeably less, most probably due to the economic downturn. Shown in the chart below, spending per person among US MMO players is down to an average of $17 in May from $27 a month last October - a $10 dive in less than a year. German MMO players, in contrast, have kept their online game spending afloat at $24.50 from $26 covering the same seven-month period. In further describing the burgeoning German MMO market, SuperData said: "the number of paying MMO gamers has jumped an impressive 37% year on year... the mechanics behind the growth of the German MMO market indicate higher transaction size, lower purchase frequency and more paying players." Additional analysis from research firm Newzoopredicts that online game spending will lean more heavily towards free-to-play (F2P) games than pay-to-play (P2P) games. 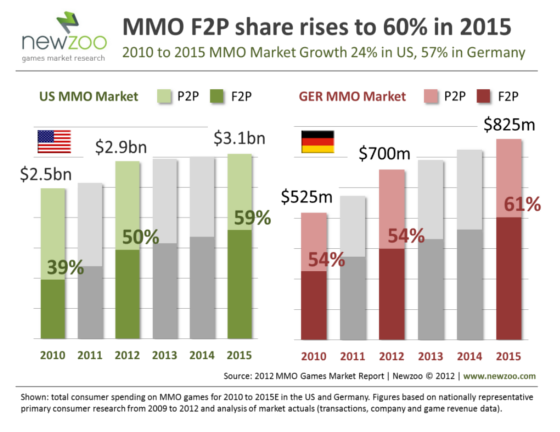 As seen above, in 2012, 54% of the $700 million annual spend on the German MMO market went to F2P games. This will climb seven additional percentage points to 61% of $825 million by 2015. The trend to more F2P spending is not only unique to Germany; the US MMO market is also predicted to take a similar trajectory. The growth of the German MMO market and its resiliency is far from surprising given how big gaming has become in the country. Cologne, the fourth-largest German city, is the annual host to gamescom, which touts itself as the world's largest trade fair for interactive games and entertainmentwith a quarter of a million guests trooping through its exhibit halls. A total of 557 companies from 39 countries - up from 505 companies from 33 countries in 2010 - took part in gamescom 2011 on a gross surface of over 120,000 square meters,based on last year's data. More importantly, 257 of these exhibitors came from Germany alone. It is no surprise then that with booming local interest and blazing development in gaming, the German MMO market has been flourishing. While there is scant data to correlate higher MMO game spending to higher RMT spending, the data does suggest that German gamers are increasingly allotting more of their leisure budgets to online gaming. RMT sellers will be challenged to offer currency and products aimed at the German MMO market if they want a share of this fast-expanding pie.